Russia’s Ministry of Industry and Trade plans to establish a department designated to defend its business in the World Trade Organisation (WTO) and other international bodies. Details of the new advisory body have not yet been released but the department is expected to have more resources than the exports division of the Ministry of Economic Development that aids Russian businesses overcome administrative barriers in international markets. “We welcome this initiative because our business has long missed expert opinion in business and competition policy on the domestic market and abroad” Alexei Portansky, a senior lecturer in the trade policy department at the National Research University Higher School of Economics told The BRICS Post. “The question is how wide will the financial and expert capacity and mandate of this body be?” asked Portansky. Analysts believe the initiative should have been introduced long before Russia joined the trade organisation. “In other countries experts were studying the WTO years before their country joined the WTO. It’s hard to say if we will make up for the lost time. So far I can’t see the government make much progress to make up for it. “The gap in experience between Russia’s and long-standing members’ experience in negotiating and disputing is extremely wide,” Portansky said. Russia joined the World Trade Organisation in August last year. The new body could play a vital role due to Russia’s lack of experts and lawyers specialising in WTO law and trade policy. WTO back-offices exist in other member states, but they are usually set up by the companies themselves. “It’s probably wiser if the entrepreneurs establish this body themselves, because in this case they will know for sure what they are paying for, while the bureaucratic structure might make mistakes. But still it’s better than nothing,” Portansky told The BRICS Post. Speaking at the fourth INNOPROM Industrial Trade Fair in Yekaterinburg the Russian Union of Industrialists and Entrepreneurs (RSPP) President Alexander Shokhin said that 50 per cent of Russian companies said they are yet to witness positive effects of the country’s WTO accession. 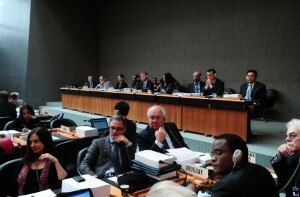 Shokhin also suggested that Russia lacks the mechanisms necessary for working with competitors at the WTO, especially when it comes to commercial disputes.